Bridge to Liver Regeneration: Scott Nyberg, M.D., Ph.D. 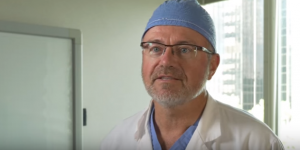 The research of Scott Nyberg, M.D., Ph.D., Mayo Clinic liver transplant surgeon and biomedical engineer, is focusedon the development of a multidisciplinary bioartificial liver to improve the treatment of patients with liver failure. The bioartificial liver is an important supportive therapy to bridge patients in liver failure to liver transplantation, or to avoid liver transplantation when spontaneous recovery is possible. Dr. Nyberg’s initial results from the first year of research funded by the Regenerative Medicine Minnesota initiative have shown that the bioartificial liver can improve survival in an animal model. Study data has been presented at several professional meetings. He plans to continue his research, and preliminary steps are being taken to test the device under FDA oversight with the goal of moving the technology into the clinic. View Dr. Nyberg's progress video. For more information on liver regeneration, visit the Mayo Clinic Center for Regenerative Medicine website. Very useful and informative research.